Keeping food hot or cold for hours. Durable and fully stainless-steel, the Thermos Stainless King 470ml Vacuum Insulated Food Jar is equipped with Thermos vacuum insulation technology that provides maximum temperature retention, hot or cold. 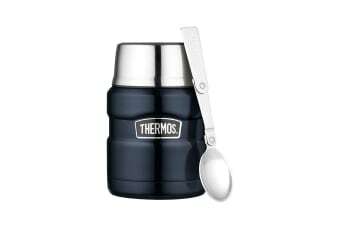 Perfect for taking meals on the go, the Thermos Stainless King 470ml Vacuum Insulated Food Jar (Midnight Blue) is vacuum insulated that eliminates temperature change. This foor jar is cool to the touch even when filled with extremely hot foods and sweat-proof when filled with icy cold drinks or foods. The domed stainless steel lid also doubles as an insulated bowl.